Let's make one thing clear from the get go; this is NOT a Pixar film - although I wouldn't blame you for getting confused, especially in a year where Pixar released a Disney-style film with princess flick Brave. Now it's Disney's turn, and funnily enough they're following it up by releasing a Pixar-style film with their latest animated picture Wreck-it Ralph - has the world turned upside down!? It's probably fair to say that it's been a bumpy road for Disney animation through recent years. The rise of Pixar, while phenomenal for the animation industry and other studios, did send the mouse-eared monopoly tumbling, and the traditional hand-drawn animation/fairytale musical formulae with it (rather ironically, now that Pixar is a Disney owned property). As a result the studio struggled to create their own competing contemporary computer-animated tales such as box-office flops Chicken Little and Meet the Robinsons. In recent years however the studio has found its feet once more through a recent string of critical hits from The Princess and the Frog (although it's poor financial performance practically forced hand-drawn animation back into storage), Tangled, and now Wreck-it Ralph. 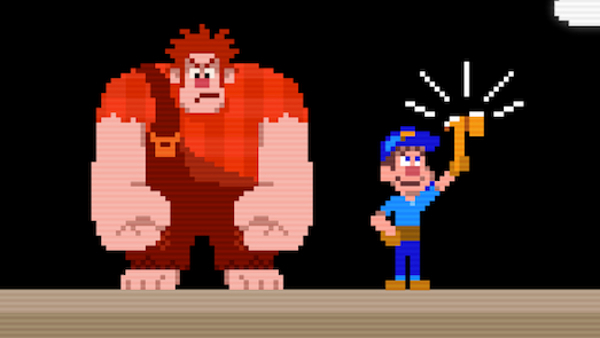 Wreck-it Ralph and Fix-it Felix Jr. in their 8-bit arcade game world. Set inside the video game worlds of a small town arcade, titular character Ralph (voice of John C. Reilly) is a villain in an old school arcade game called Fix-it Felix Jr. As you'd expect, life as a villain isn't always peachy - who really likes the bad-guy!? But even if his fellow video game villains tell him that being a bad-guy doesn't make him a bad guy, Ralph still longs for the perks of being a hero. Once an opportunity opens for Ralph to prove his worth, he seizes it by game-jumping into the Call of Duty style first person shooter Hero's Duty and the candy land of Mario Kart style racing game Sugar Rush, where Ralph will discover whether or not he really does have what it takes to become a much adored hero. So from that synopsis, it's easy to see how this is being confused with a Pixar studio film - it's Toy Story for video games! With the lack of a fairytale/musical narrative being replaced by a contemporary tale which features pop-culture characters, set in a computer graphic world in a film made of computer graphics, the film imitates a move made by Pixar back in 1995; as the Pixar team made Toy Story they used these very techniques to differentiate themselves from Disney and to establish themselves as something new, and as the technology wasn't perfect and resulted in plastic looking results, they opted for a largely plastic world! Now as Disney struggle to clasp onto the animation market they once owned in a modern world that's moved on, the studio has been forced into a re-birth to meet demand. Cue Wreck-it Ralph. Ralph game-jumps into the first-person shooter game Hero's Duty. 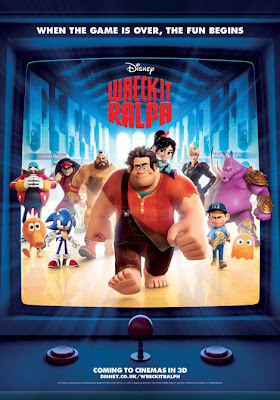 Easily stronger than any Disney film in recent decades, better than most offerings from competitors such as DreamWorks, and even equal to some of the works of Pixar, Wreck-it Ralph is a very cleverly constructed, creatively created, entertaining and engaging piece of work. The world that the filmmakers have created is genius, from the game central station hub in the mains power supply through to the different game portals which allows for the game-jumping plot element to steal the show. Scenes of Ralph venturing into Hero's Duty for the first time are for me the highlight of the film, and executed perfectly with incredibly entertaining results. Each of the specially designed worlds, and the editing styles and music that accompany them, are pulled off perfectly to make their contrasting environments a lot of fun to explore (hello sequel!). For any video game fans watching the film, a vast number of cameos and references that are found throughout add an extra layer to the enjoyment of the film (the Pac-Man ghost cameo is my fantastic), but this cleverly executed comedy adventure is simply for everyone, and even those who haven't touched a games console in their life will still be able to enjoy the film. The reason why: well conceived characters such as Ralph and Vanellope (voice of Sarah Silverman) and the journey they embark on to find recognition and acceptance in a world that looks down on them is both heart warming and deeply human. If I have any complaints about the film though it is that it does run a bit long during the Sugar Rush scenes in the second-act, with the characters staying in the world for slightly too long and marginally breaking the flow. Alongside this, some of the story, dialogue and jokes do play to a slightly younger audienceon the odd occasion rather than engaging the entire family audience as a Pixar classic like Toy Story, The Incredibles and Monsters, Inc. would. Speaking of Pixar, whilst Wreck-it Ralph may resemble a Pixar film, it very much isn't one, and certainly lacks the special timeless quality that the Pixar films have; partly thanks to the use of one or two contemporary pop-songs, and the inclusion of established pop-culture characters (for comparison, whilst Toy Story uses Mr. Potato Head as a recognised character but develops a unique personality for him, Sonic the Hedgehog appears as Sonic the Hedgehog already does in his own games), both of which may cause the film to age quickly. It's difficult to say whether or not this film will be as loved 20 years from now, but for the time being it's difficult not to enjoy Disney's efforts with Wreck-it Ralph - and the fact that I am comparing it largely to the works of Pixar is hardly a bad thing! Son of a Glitch! Vanellope's troubled life adds to the humanity of the film. Wreck-it Ralph (certificate U) is released in cinemas across the UK on February 8th. Are you looking forward to Wreck-it Ralph? Have you already seen it? Agree or disagree with my review? Leave your thoughts and opinions in the comments section below!